The twenty-first century political dispensation has gone past ranting and yelling on political dais. It is a dispensation that put together grassroots mobilization,efficiency and democracy. I used these words because they seem to me to contain the kernel of every electoral success of a political party going into competitive elections. Grassroots mobilization because the system of political organization must be close to the common people in the street and their problems. *Efficiency* because he who is in the helm of affairs must be capable of managing the welfare of the grassroots who form the base of party organization in a way which will help to raise the standards of living. *Democratic* because it must not only find a place for growing class of educated men and women, but at the same time command the respect and support of the masses.He who understands these principles of party organization is nobody than our own *STEPHEN AYESU NTIM* the Grassroots Friend, Unifier and Game Changer. 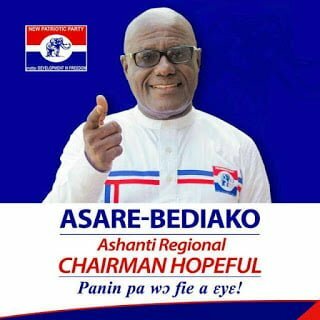 A VOTE FOR NTIM IS A VOTE FOR GRASSROOTS RECOGNITION AND NPP IN POWER BEYOND 8(EIGHT) YEARS!!! BUILDING A STRONGER NPP TOGETHER! CONSOLIDATING POWER BEYOND 2(TWO) TERMS TOGETHER! !